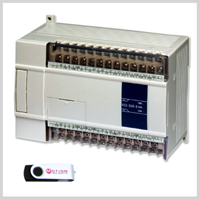 MO-CON205-32T-C controller is a fully featured Motion Control PLC dedicated to driving a range of drives. The module features 4 channel pulse outputs for stepper or servo motor drivers up to 400kHz. So the unit complements our extensive range of stepper, brushed and brushless servo drives. The products are very cost effective and includes free programming software. Our new HMI and PLC's also have a host of options, so we can also supply a particular product from our range to suit your motion control application needs.